I think its always important to share resources for grieving dads, grief therapists, counselors and anyone else who is personally or professionally involved with a grieving dad. I wrote my book because I couldn’t find any resources for men when I was dealing with the aftermath of losing my children. I felt alone and isolated and I didn’t want anyone else who follows in my footsteps to ever feel alone in this nightmare. I recently had a grieving dad reach out to me and inform me of his new book called “A Girl Named Dennis: Find a way through losing a child: a fathers story”. The following was sent to me along with the book that gives a brief overview of his story and why he wrote the book. “After I lost my daughter to Spinal Muscular Atrophy in 2009, almost immediately I began writing a book about the experience. At first it was just for me – my way of expressing myself, of making sense of what had happened, and maybe starting to heal very slowly. 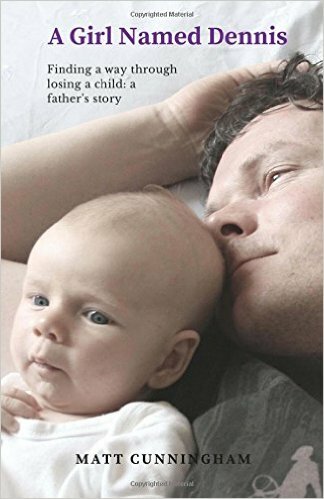 It wasn’t until much later, when the book was first being read, that people began saying how helpful it could be for others, but particularly for men – the dads, the husbands, the guys who try to be the rock when life is crumbling around them. Who ever tells their story? If you think this book could be a resource for you, check it out. To provide full discloser, I have yet to read the book, so please let us know what you think if you do decide to read it. A big congratulations and “thank you” to Matt for having the courage to put his story out there so others can learn, connect and hopefully not feel so along on this path. Seeing these new books often inspire me to start working on my next book. It’s been rattling my head for a while. Writing a book is a huge time commitment and the process is daunting. Who knows, maybe in the next year or so.